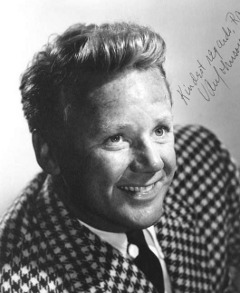 Van Johnson was a baby-faced, redheaded, rather hammy film actor of the 1940s, 50s, and 60s. He is perhaps best remembered as the executive officer who seized command from Captain Queeg (Humphrey Bogart) in The Caine Mutiny. He also starred in Battleground with Ricardo Montalban, and Frank Capra's State of the Union. His parents divorced when Johnson was a toddler, and his father was given custody due to the mother's alcoholism. Young Johnson was dancing in theatrical musicals while still attending high school, and made his Broadway debut as a chorus boy in 1936. He was still in the chorus for the 1939 Broadway production of Richard Rodgers' Too Many Girls, and he made his film debut dancing the same role when the play was filmed with Lucille Ball. For many years, Johnson was an extremely close friend of actor Keenan Wynn and Wynn's wife, Eve. They had met when all three were struggling actors in New York in the late 1930s, and after Johnson and Wynn both signed with MGM and moved to Hollywood, the bachelor Johnson reportedly spent as much time at the Wynns' home as at his own residence. In 1943, the Wynns were passengers in Johnson's car when it was broadsided by another vehicle which ran a red light. Johnson was seriously injured, and had a metal plate installed in his head. He then recuperated for several months at the Wynns' home. The accident may have been a lucky break for Johnson, as it left him unsuitable for military duty during World War II. While many of his contemporaries were at war, Johnson rose to prominence playing military men in features like A Guy Named Joe with Spencer Tracy, Two Girls and a Sailor with June Allyson and Gloria DeHaven, and Thirty Seconds Over Tokyo with Robert Walker. In 1947, the Wynns were divorced, and Johnson married the former Eve Wynn on the same day her divorce was finalized. They were separated in 1961 when, according to Johnson's stepson Ned Wynn, Johnson had an affair with a chorus boy during a stage production of The Music Man. In 1999, just a few years before her death, Eve Wynn Johnson told a reporter that her marriage to Johnson had been arranged at MGM's request, as the studio "needed their 'big star' to be married to quell rumors about his sexual preferences," and she was the only woman he would agree to marry. Tappan Zee Manor, Nyack, NY.